The Trencher, from CRKT, is an entrenching tool that provides a perfect blend of ergonomics, utility, and brawn. It has a unique three position heavy-duty shovel head that features an aggressive and sharp wood saw on one side and a beveled edge for cutting roots and chopping wood on the other side. 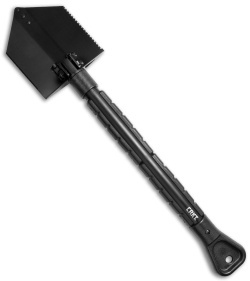 The reinforced steel tip on the shovel head makes rocks a non-issue and the handle was made to stay comfortably in hand during heavy use. Upon closer inspection, you'll find the handle is outfitted with a wire cutter that runs the full length of the handle. 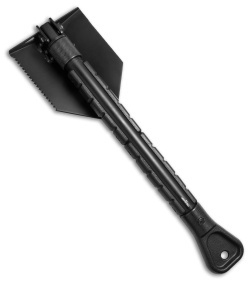 The Trencher is a mission-ready tool and includes a MOLLE compatible nylon sheath. 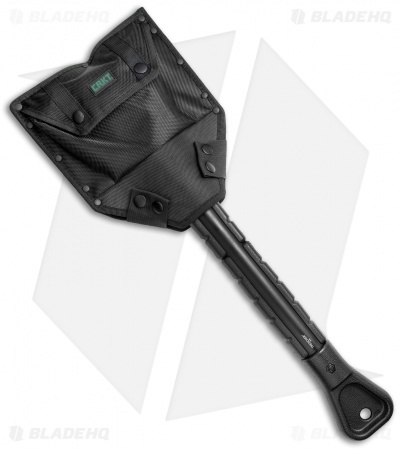 The sheath is quite large, I just leave it at home and attached the shovel directly to my pack. The plastic handle and grips are removable, you can cut down on weight and make the pole thin enough to weave through straps/molle webs on your backpack. The sawtooth edge is super sharp, I'd recommend covering it with ducktape while hiking if you're not going to use the sheath. It did get duller after banging it against rocks too many times. 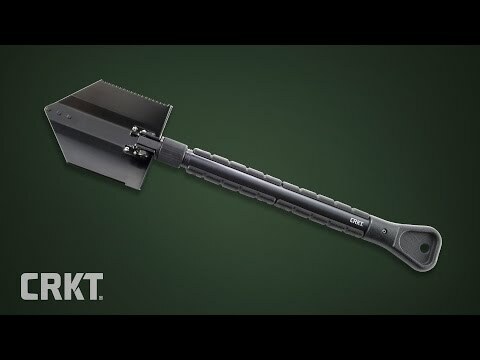 Although it's not as effective as an axe, it's heavy enough to use for minor wood cutting. The locking mechanism is extremely heavy duty, it won't wobble loose even under hard abuse. It won't get stuck either if you screw it in too tightly.